These images are some more stills from my "The Purple Heart Sword" student film. To the left you'll see some of my cheesey lightning effects done in Metacreations Painter. Yep, that's Danielle Perrone holding the purple heart sword there. While filming this scene, during one of the takes, the park security showed up. I only wish that I had kept filming. It would have been a great outtake. 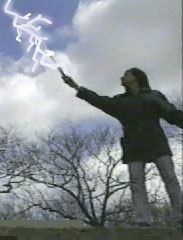 The following stills are from the opening credits of "The Purple Heart Sword". That's me doing some Tai Chi in a field there. I added those big 3D titles in post production. Each word falls from the sky and then scatters towards the camera. For this scene, I had to reproduce the original lighting so the shadows would fall properly. I also used front projection image mapping as opposed to alpha channel compositing. 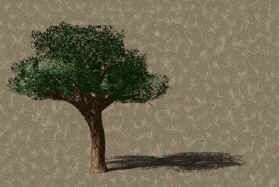 This is a 3D tree that I made for Guymark Studios for a corporate video they were producing. It begins as a small tree then grows and produces leaves. I used the alpha channel throughout the animation such that the tree can be easily composited with other footage in AfterEffects.